Commercial poultry production is strongly specialized throughout the world. There are breeds that are specialized in laying eggs, others in producing meat. Because the males of layer breeds do not produce eggs and are not profitable in producing meat, they are selected and killed when one day-old. This happens throughout the world. In The Netherlands 30 million chicks are killed each year. In general they are utilized as feed for zoo animals, reptiles, birds of prey, cats etc. Another development is the increasing interest in Farm Hatching systems. Hatching eggs are incubated for 18 days and transported to the broiler farm. Eggs hatch at the farm and chickens find feed and water when they feel ready for it. No transport stress for chickens and no cross contamination in the hatchery! Very welfare friendly. But. What to do with second grade chickens and live embryos in the shells that failed to hatch? Killing of day-old chicks is controversial. Alternatives are not yet available, except in the new layer housing concept of Kipster, where the brothers of the female layer chicks are grown to 16 weeks and slaughtered for poultry burgers and sold in the Lidl supermarkets in The Netherlands, alongside the Kipster eggs. The Dutch Ministry of Agriculture, Nature and Food quality therefore initiated research towards more alternatives. Within this project societal acceptability of possible alternatives was examined by a public enquiry. Not all alternatives were ranked higher than accepting the current practice of killing chicks. For instance, killing of embryo’s ranked lower that the current practice, probably because the chicks can be utilized as animal feed. If chicks are killed, this has to be done with minimal discomfort for the animals involved. As the current practice of killing day-old male chicks will be in use for several years, the Dutch ministry decided to have an inventory of the methods applied in Dutch hatcheries and to examine their effectiveness. This as part of a large project to examine discomfort among farm animals during slaughter and large scale killing in case of outbreaks of contagious diseases. This report describes how killing of day-old chicks is carried out in Dutch hatcheries. Also the results of laboratory experiments on behaviour and physiology during the process of killing are given, in order to underpin effectiveness of methods used in practice. All Dutch layer hatcheries kill day-old male chicks using CO2 methods. Since 2009, all layer hatcheries apply automatic machines to kill day-old male chicks. These chicks are a valuable by-product to feed carnivorous animals in captivity. Compared to the number of killed day-old chicks in layer hatcheries, the numbers of killed day-old chicks in layer great grand parents stock (GPS) and parent stock (PS) hatcheries are low. Broiler hatcheries kill second grade day-old chicks using either CO2 methods or a shredder, depending on retailer demands. The undesired female or male chicks in GPS and PS hatcheries related to the broiler industry are not killed, but sold alive as broilers. Despite the variety in methods, exposure time and CO2 concentrations, all methods applied in the Dutch hatcheries were equally effective: no day-old chicks recovered afterwards. Proper handling of the killing equipment by hatchery personnel appears to be more important for animal welfare than the method used. When chicks are exposed to CO2 gas, a certain discomfort can be observed as gasping or heavy breathing, followed by neck stretching or head shaking and jumping movements. There were no differences in the timing that chicks lost posture, when they were placed in either 60% or 80% CO2. After loss of posture, heavy breathing continued although on a lower frequency. After loss of posture, convulsive movements with wings and legs were observed longer in day-old chicks exposed to 60% than to 80% CO2. When day-old chicks were exposed to 80% compared to 60% CO2, an ECG silence occurred sooner, EEG suppression occurred sooner and faster, and minimal brain activity occurred sooner. Chicks are able to recover after exposure to 60% CO2 for 10 minutes. Based on literature, it is likely that the welfare of day-old chicks is reduced during the phase of head shaking and jumping. The duration of reduced welfare however is only short (13-16 seconds) and the probability on recovery is very low after exposure of day-old chicks to 80% CO2 for at least 3 minutes. It can be concluded that the CO2 method is an acceptable device to kill day-old chicks. The equipment used should be prefilled with CO2 gas to induce unconsciousness as soon as possible, and the minimal CO2 concentration should reach at least 80%. 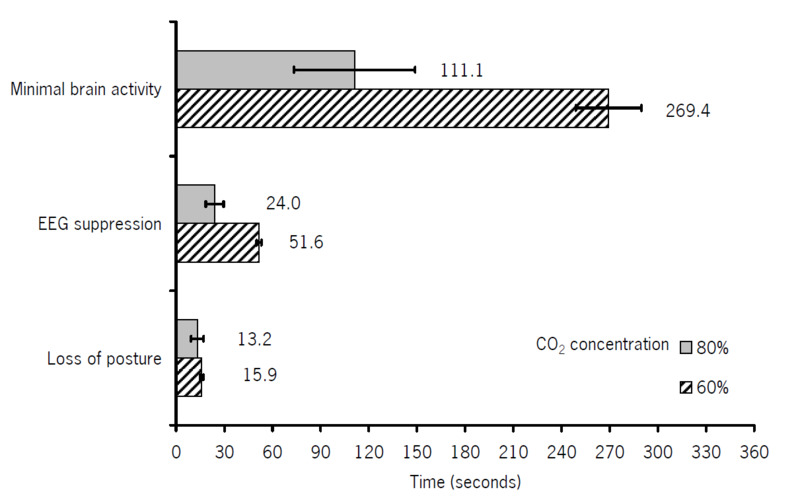 The minimal exposure duration at 80% CO2 should be at least 3 minutes to suppress EEG signals. Figure 2. 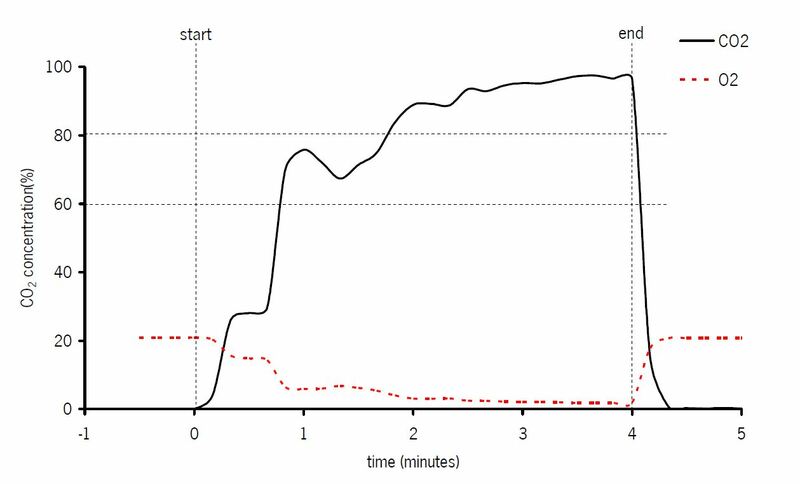 Time in seconds (mean ± SEM) to loss of posture, to EEG suppression, and to a near iso-electric point (minimal brain activity).